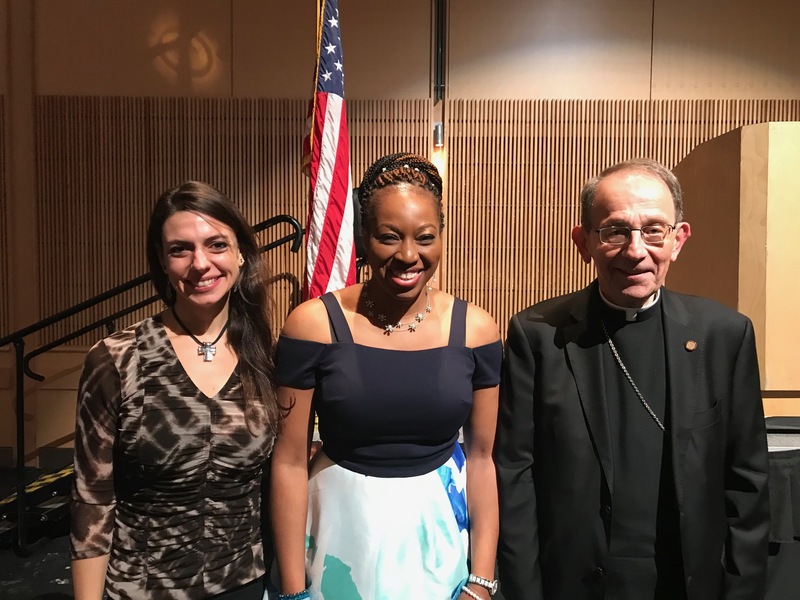 Bishop Lawrence Persico with Marielle Lafaro of People for Life, left, and Obianuju Ekeocha, founder and president of Culture of Life Africa and keynote speaker at today’s 41st annual Pro-Life Breakfast at the Bayfront Convention Center in Erie. Contributed photo. The 2012 announcement that Melinda Gates would help lead an international campaign to bring contraceptives to millions of women in African countries gave Obianuju Ekeocha pause. It was, she said, yet another example of what she describes as “ideological colonialism” – an effort by western organizations, governments and wealthy philanthropists such as Gates to come into African countries and try to set agenda and policy and influence the culture. Ekeocha, president and founder of Culture for Life Africa, addressed that issue as keynote speaker at People for Life’s 41st annual Pro-Life Breakfast on Saturday at the Bayfront Convention Center in Erie. More than 500 people were in attendance, including Bishop Lawrence Persico. “We don’t have organizations that are solely dedicated to abortion rights,” in African countries, Ekeocha said in a telephone interview before the event. “We are finding international organizations and (non-governmental organizations) come in and then they begin to infiltrate, if you like, African institutions. Culture of Life Africa, an initiative “dedicated to the promotion and defense of the African values of the sanctity of life, beauty of marriage, blessings of motherhood, and the dignity of family life,” works to counter those efforts. Ekeocha is also an author, public speaker and documentarian – her movie, “Strings Attached”, is scheduled to be released this fall. She recognized the work of Erie’s pro-life community and deliver a message of unity and a call to action. People for Life is also sponsoring a bus trip to Washington, D.C., for the annual March for Life on Jan. 18, and an Erie March for Life on Jan. 26. More information can be found at www.peopleforlife.org.